In our first test of H.265 cameras (including Samsung and Vivotek), H.265 benefits were essentially nil, both versus leading H.264 cameras and, worse, to emerging smart codec H.264 cameras. 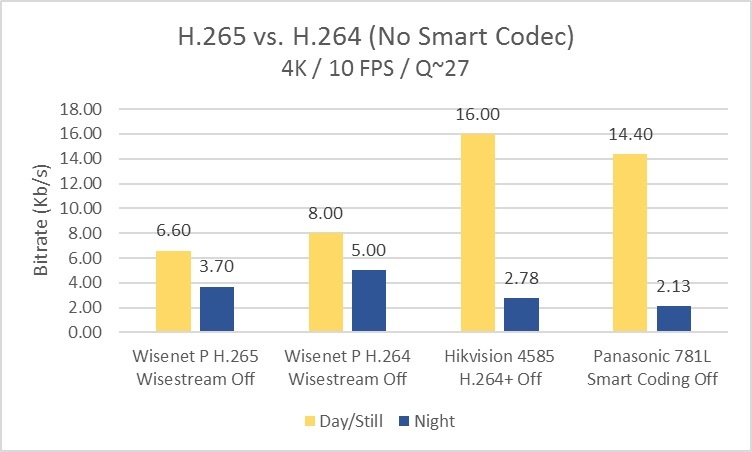 Now, Hanwha is claiming improved H.265 performance combined with their Samsung Wisestream smart codec in their Wisenet P and Q lines, aiming to reduce bitrates to new lows. We tested P and Q series cameras against smart codec equipped competitors from Axis, Hikvision, and Panasonic, both 1080p and 4K resolutions, to see how this new smart codec performed with H.265. ** ******** **** ** *. *** ******* (********* ******* *** *******), *. *** ******** **** *********** ***, **** ****** ******* *. *** cameras ***, *****, ** ************* ******. *** *******. ***, ****** ** ******** ******** *. *** *********** ******** **** ***** Samsung ********** ***** ***** ** ***** ******* * *** * lines, ****** ** ****** ******** ** *** ****. ** ****** * *** * ****** ******* ******* ***** ***** equipped *********** **** ****, *********, *** *********, **** ***** *** 4K ***********, ** *** *** **** *** ***** ***** ********* with *.***. **** ** *. *** *******:*****, *** **** ** ********** *. *** *** ******* ***** **** the **** ******** ** ***** **** *** *** *** **** benefits *** * *** * *****, **** ***** ***** ******* end-to-end *******. **** ** ******** ** ****** ** *** **** future ** *** ***** ******* *. *** *** ****** ******* **** be ******* ******* *. *** ******* ** *** ******* ***** ****. *. *** ***********:*. *** **** ********** *** *********** **** ***** *************' ******** ***** smart ****** ** *** *****, *** *** *********** ****** ** any *****. *******, ** *** ********* ** *** ***** ****** (Avigilon, *******, *********, *****, *****) ** *** *****. *** ****** *****:** *** *****, *********'* ** ****** **** ***** ****** ******** lower ******** **** *** ******* * ***** *. ***/********** ** ******* scenes, *** **** *** ********* *** **** ***** ****** **** produced ***** ******* ******** **** ********** * *****. ******** '****' ***** ******* ********: *** '****'******* ****** *********** *********** *** ******** ** ********** *******, ****** this ******* ****** ******** *** **** *****..
*******, ** ** **** *****, *. *** ***** ******** ****** ***** it *******, **-**%, **** ***** *** **% ************* **** *******. ********** "******" *** ********** ***** ******* ******, ****** ******* ** other ***** ******, **** ** **** ********* (****), *** ********* H.264+. ********** ****** ******* ******** ** **%+, **** ********** **** **% with ******* *** *******. ******* *** ** *** *** *** *** ****** *********, ********* Wisestream ** ** ******* ** ********. ** *** ** ******* * ******, *. *** **** ********** ****** and ******* *** ******** ***** ******** **** **** *** ********* cameras, *** ****** **** *** ********* ** ****** **** ***** Coding (****) ** ******* ***** *** **** ****** ******. ** *** ***** ******* * ******, *. *** *** *** ****** bitrates ***** *********** *. *** ***** ***** ****** (**** *** *********). ******* * *** * *. *** ******* **** *** ********* ** Axxon ****, ********* ******** *********, ** ******* ******** ****** (*** of ***** ******* *. *** *********). ********** *** ******* *** ***** *. *** **** ******** ********* ** all ***** ******, ********* ********, *****, *****, *******, *** *********. ********** ** ********* ********* ** ********** ***** *********. ***** *** ****** ***** *** **** **** *** ** the ******* **** (**/**** *******, ***** **, ***.) ** **** as *** *** *** (***/*** *** **** ***** *****/*******). *** *** **** ** ******** ******* * ****. ****** *** **** ** ******, ********* *** *** ******* Q *** ** ******* * ******. *. *** ** ******** ** * ****** **** ** *** ******'* web *********, **** ** *. *** *** ***** *******. ************* ******* for *. *** *** ******* ** *. *** (*** ** "***" – see **** *****, ***** ****, ******* ***, ***.). **** ******* ** **** **** *** ******* *** ******* ***. Dynamic *** ******** ** * ******* ** **, *** *** be ********* ** ***. *******, ********** (******* ***********) ** *** ******* ** *** ***** profile ****, *** ******* ***** ****** ********. ***** *** ****** off/low/medium/high, ********* *****. ** *** *****, ********** ***** ******* *** ******* ** ****** levels ** ********** (********** ****), ***** *** ** * ********* problem ********* ** *** ****'* ***. *** ******* ***** ***** the **** *** ***** ******** **** *** ******* ****, **** noticeable ******* ** *** *** ******, *** ******* ********** ** quality ** ****. ** *** **** ******, ** ***** **********'* "******" ******* ** be ******* ******* *** **** ********* "****" (**** ***** ** 1080p ********) *** *********'* *.***+. ******* ** ****, "******" *** used ** *** ***** ** **** *********** ** **** ******. ***** ********** ****** *** **** ** *** ** *** ***** cameras ** **** ****, ** *** *** ***-*****, **** ******* resulted ** ************* **** ********** *** ***** ***********. *** *******, in *** ********* *****, ****** ******* ** *** ******* ****** moderately ******* ***** ****** (*** ****), ***** *** *** ** issue ** ***** ******. ** ******** ********* ***** ********** *** ** ******, ** * compromise ******* ***** ******* ********* (********* *****) *** ******* *********. ********** ****** ******* ******* ** ~**% ***** **** *. *** *** H.265, *** **** **% **** ******* *** *******. *******, ******* GOV ** *** *** *** ****** ******, **** ******** **** slightly ***** **** **** *** ******* ********. **** ** ******* to **** ********* ** ******* *********, ***** ******** ******* *** when ******* *********** ** ********. ** *****, ********** *** **** ********* **** *. ***, ******** ******* by ~**% ******* ******* *** *** ** **** **% **** it *******. *. *** ********** **** *********** (**-**%), ****** *** ** great. ********** "****" ******* ******** ** ** ** ** ********** **% compared ** ********** ******, ****** **** *********** ***** ******* **********, as ***** *****. ** ****** *. *** ***** ********** ** **** *** **** *** Wisenet * **** ** **** ** *** *** **** ******* Q. *********** ***** **** ***** ***** ********** ****** *** ******* GOV ***. ***** *. *** **** **********, *** ******* ** ****** *** *********** with ***** ** ****** ** **** ***** ** ******* ******, though ******* ****** **** *** ********* **** ** ******* **** motion. ** *****, *** *. *** ******* *** ************* ***** **** others, ~* **/* ***** *********, *** * **/* ***** **** Hikvision. ** *** ***** ******* * ******, ******-***** (*** *** ****), *. *** ******** ******** ***** **% ***** **** *. *** ** the *****. *******, **** *** **** *** ********* *******' ******* ******** **** lower **** *** ******* *'* *. *** ******, ** ***** *** Kb/s. *******, ** *****, *** ******* * (*. *** *** *. ***) was ************* *****. ** ****** *** ***** ****** ** *** ******* ** *** how *. *** ******** "***" ******* *.***. ** ******* ******, *** Wisenet * ******'* *. *** ******* *** *** ****** ** *** cameras ****** ** **%+. *******, *** *. *** ******* *** ************* (40-50%) ***** **** ***********, ** ****. ** *****, **** *** ********* *** ********* *******' *. *** ******* was ***** **** **** *** ******* *'* *. *** *** *. *** stream. ********* *. *** ** *. *** ** *** ******* *, *. *** *** ~18% ***** **** *. *** ****** *** ***, *** ~**% ** night, **** ***** **** *** **% ********* ********* ******* ** manufacturers. *** ******* * ****** ******* ****** **** *** ********** ********* by *** ***** ** *** **** ** *******. *. *** ********* via ***** ***/** ****** ******* ****** ******** ** ********, *****, Genetec, *** *********. *. *** ********* *** *** **** ** *** VMS ********** *. *** (***** ****, *******, ********* ********* **** **). ********** *. *** ******** *** **** *** ******* ****, **** ***** support *** ******** ***** ****. ******* ****** *** ****** *** **** ***** **** ******* *. ********* *** **** *******. Great summary and testing! I have a couple of questions as it pertains to the PC requirements for H.265 in general. I have been hearing that H.265 requires more robust PC hardware to decode both live and recorded images and would cost the customer a sum of money to upgrade existing workstations or that the cost of the workstations and hardware required to decode H.265 would be higher than using standard hardware and just increasing the customers storage. Is this true or false or somewhere in between? Could you please speak to this aspect of H.265? Could you also provide the specifications of the PC that you used to test? 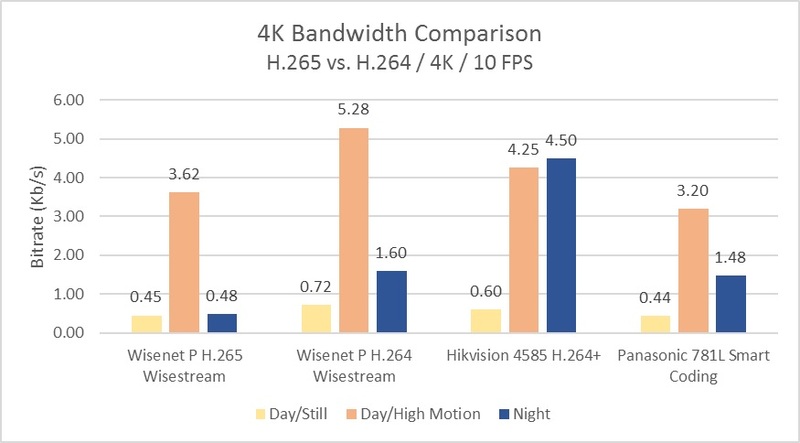 Comparing H.265 to H.264 in the Wisenet P, H.265 was ~18% lower than H.264 during the day, and ~25% at night, much lower than the 50% reduction typically claimed by manufacturers. Is there a "Day/High Motion" in this test? Yes, I'll dig out those numbers this afternoon for you. Actually, I just realized neither the Hikvision nor Panasonic increase in higher motion, because they both force 16 Mb/s caps. That's why I didn't include that in the report. Since they're both bumping the cap, we can go as far as testing how much they increase quantization in those scenes, but I did not for this test. It is sort of interesting they both force caps that low, considering I've seen some of the 4K cameras spit out a 20-30 Mb/s stream at times. I'll grab the Samsung numbers and reply back. Ethan, are you sure they max out at 16 Mb/s? It can be too low for comfort to handle peak events and could mean loss of detail, or even frames, in complex scenes or when panning and zooming. There is probably a setting somewhere to remove this bitrate cap? It would also be interesting if you can test the smart encoders in daylight with high motion (like moving the camera sideways), and compare the image quality and bitrate with non-smart encoders. I have seen similar results as well to bad the WV-781L cost does not come close enough to the Q series to justify it. Are you saying the image on the 4MP QNO-7010R is better than the 4K WV-781L? being around 38% for Day/Still and 32% for Day/Motion and 70% for Night. IMHO, someone interested in bandwidth savings would probably have smart codecs on to begin with, so I think this is an important metric for h.265 on vs h.264. It's expected that smart H.265 should outperform smart H.264 by a wider margin than non-smart/'raw'. This is partly due to that H.265 compresses I-frames more efficiently and in static scenes the I frames will dominate the streamed data (P and B frames will be small). H.265 further has more functions that 'smarts' can use. So assuming that smart encoders is the default use case, H.265 performs quite well. Still, a full H.265 encoder should have a 40-50% lower bitrate than H.264 in the 'raw' based on test of reference encoders, at least for more complex scenes. That Wisenet has a smaller difference may be due to the chipset or tuning immaturity. One expect that to improve.